From headquarters of the U.S. Marine Corps: âCaptain Teresa Q. White/USMCR has been selected as the recipient of the 2013 chambers award for outstanding leadership. Captain White was selected after a thorough deliberation by a board of field grade officers. The competition was exceptionally keen. 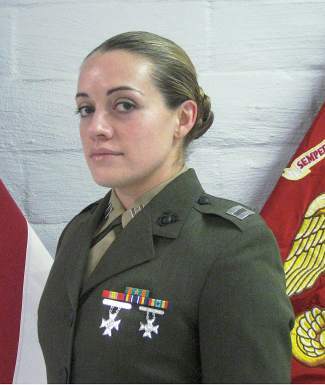 Nominees had exemplary records which indicated noteworthy leadership and command ability.âCaptain White is assigned to Trans SVCS Co., Combat Logistics Battalion 23, Combat Logistics Regiment 4, 4th Marine Logistics Group in California. Captain White is the former Tess Quinn, of Eagle. Her parents are Terry Quinn and Jackie Potter, of eagle. CAPTAIN WHITE IS ASSIGNED TO TRANS SVCS CO, COMBAT LOGISTICS BATTALION 23, COMBAT LOGISTICS REGIMENT 4, 4TH MARINE LOGISTICS GROUP IN CALIFORNIA. CAPTAIN WHITE IS THE FORMER TESS QUINN OF EAGLE. HER PARENTS ARE TERRY QUINN AND JACKIE POTTER, OF EAGLE.